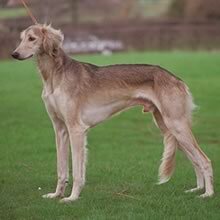 The Saluki's origin is tied to the region of the Middle East. The breed was a part of many nomadic tribes that traveled throughout the region. Smooth and silky. The hair on the back of the legs, ears, and tail should be longer and feathery. Colors can be three-colored (white, black, and brown), black with brown, grey, red, golden, cream, sandy, white or various combinations of those colors. Salukis have a mind of their own, but are graceful, peaceful, and need to be with their owner. This dog is cautious around strangers and has a very strong hunting instinct. Salukis have a mind of their own, but are graceful, peaceful, and need to be with their owner. This dog is cautious around strangers and has a very strong hunting instinct. This breed gets along well with dogs that are similar in nature. The hunting instinct is too strong in it to allow it to live with other types of animals. You can find Saluki puppies priced from $1300 USD to $2400 USD with one of our credible breeders. Browse through our breeder's listings and find your perfect puppy at the perfect price. This breed gets along well with dogs that are similar in nature. The hunting instinct is too strong in it to allow it to live with other types of animals. Regular grooming with a brush and comb is required. Ears must be checked periodically to make sure they are clean. A Saluki will never be completely obedient. With the proper degree of patience, this dog will be fond of its owner enough to be well-behaved. Salukis need plenty of exercise, but allowing one to run freely may mean that it will go on the hunt and never return. If chasing something, this dog will ignore its owner's calls. A good way to burn off a Saluki's energy is to go bike riding as it trots along beside you. Saluki Puppies for Sale - Shipped Worldwide! Finding the right Saluki puppy can be dog gone hard work. PuppyFind® provides a convenient and efficient means of selecting and purchasing the perfect Saluki puppy (or Saluki puppies) from the comfort of your home, 24 hours a day, 7 days a week. Take advantage of our PuppySearch or leisurely browse our directory of hundreds of dog breeds, Saluki dog breeders, Saluki dogs for adoption, and Saluki puppy for sale listings with photos and detailed descriptions. Some Saluki puppies for sale may be shipped Worldwide and include crate and veterinarian checkup. Many Saluki dog breeders with puppies for sale also offer a health guarantee. With thousands of Saluki puppies for sale and hundreds of Saluki dog breeders, you're sure to find the perfect Saluki puppy.